Baba ghanoush is a delicious Mediterranean dish, so easy to prepare. Baba ghanoush is a delicious eggplant dish that is so easy to prepare; in Mediterranean countries it's called an aubergine. In South Africa it's a brinjal. Would a rose smell any different if you gave it another name? We enjoyed this magnificent dish a few months ago at a tiny Lebanese restaurant, sitting alongside an ancient quay in Rotterdam. I hadn't had it for a while, so of course we asked the good hostess, and here are her ingredients. Moutabel baba ghanoush is a spicy version enjoyed throughout the Middle East; add some jalapeno or your favourite chili. You're unlikely to be able to purchase this at your local supermarket, and of necessity it would be loaded with preservatives; let's get back to the food that granny would have cooked is our advice. Yes, it does take time; all of eight minutes. One third of a peeled lemon, pulp and all, minus the pips. A couple tablespoons of Sesame Tahini. What's that? One or two cloves of garlic. This is her baba ghannoush, made with white aubergine which I can't get, and I suspect are less nutritious than the purple variety, anyway. With one in eight women getting it, breast cancer and prevention should be an issue in every family. We used to get our lignans from 100% wholemeal flour, but since the millers started cheating on labeling, it's virtually impossible to get. One easy solution is tahini, the other freshly ground flax seeds. The more difficult solution is your own electric flour mill and a determination to bake your own wholemeal bread every day; that takes me only five minutes each morning. Five hours later you have a wonderful loaf, just fantastic smeared with baba ghanoush. How to prepare your Baba Ghanoush. Method 1 can be made in under ten minutes. Wash your eggplant. Choose only bright, shiny firm fruit, otherwise your baba ghanoush will be bitter and horrid. Slice the eggplant in half and place it together with the garlic clove in an oven dish in the microwave for five minutes. Two tablespoons of sesame tahini. Scrape the eggplant pulp out of it's skin and add to the mixing bowl. I like to add a little yoghurt or kefir curds but that's my variation. Add a couple sprigs of parsley, stalk and all. Use a stick blender to liquidise the eggplant, tahini, olive oil and parsley mixture. Sprinkle with parsley and dribble with more olive oil. It takes me 8 minutes. The second method of preparing baba ghanoush takes rather longer; somewhere approaching an hour, but it's rather nicer as it has the flavour of the barbecue. 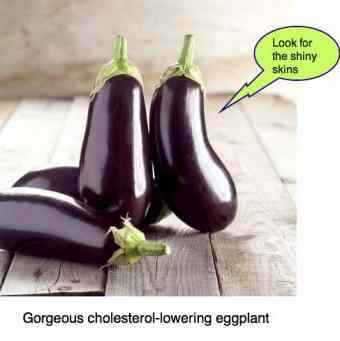 Wash your eggplant to remove any herbicides from the skin. If you have access to gas or barbecue, spike your eggplant with a fork and flame it for several minutes. Or alternatively, wrap your eggplant in aluminium foil and leave it over the coals until cooked through; probably about three quarters of an hour. Force the lightly blanched cloves of garlic into the slits in your baba ganoush. If you prefer your garlic raw, add half a raw clove later with the lemon juice. Place the eggplant on a baking dish, and pop it alongside another dish like roast chicken for about 30 to 45 minutes depending on size in a hot oven. It should be quite soft. Chop the cooked eggplant into smaller chunks and drop them into your liquidiser. Or, cut your eggplant in half, and scoop out the pith and discard the skin. It will look darker but tastes just the same. Chop and blend with the lemon and a good slosh of olive oil. Add the garlic and the tahini and a little salt and pepper, and several large sprigs of fresh parsley, and blend to a paste. NB. Eggplant has a subtle lovely flavour. Don't overpower it with too much garlic or lemon. Pour into a small bowl, and garnish with more olive oil, parsley and the sliced paprika or other salads, and olives. Of course, there are a 101 variations. I like to add a couple tablespoons of yoghurt. Even omit the tahini if you can't get it; God forbid you live in a country where you can't get this sesame paste; I would immediately emigrate! Seriously, it's easy to make from basic principles, though more expensive and in my opinion not as toasty. Another excellent variation is to cook your aubergine on a barbecue. The taste of the smoke adds a delicious tang. Sliced cucumber and shallots; lekker as they would say in South Africa or eet smakelijk as we now exclaim in Holland. Sprinkle your baba ghanoush with some ground sunflower seeds or freshly cracked pecan nuts. Enjoy your Baba Ganoush; it will keep in the fridge for a few days, but as with all home cooking finish it as soon as possible. Experiment with your side dishes and tailor them to your own tastes. Make it the way you like it. It makes a great spread on your lunch sandwiches, or with a green salad. 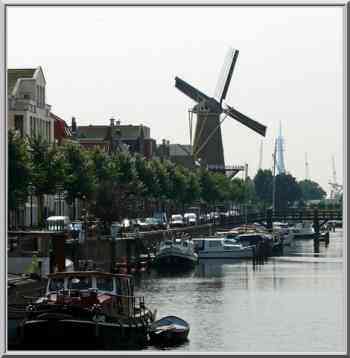 If you ever visit Holland, make sure you don't miss Delfshaven in Rotterdam. It's about the only part of the old harbour that the Stukas missed in WW2. It's a treat. Look out for the tiny Lebanese restaurant. Keep looking for more eggplant recipes. There are many ways to cook this so called functional food; it has many health promoting and disease preventing properties. Eggplant should be on your menu at least once a week when they're in season, and none is easier to make than baba ghanoush. 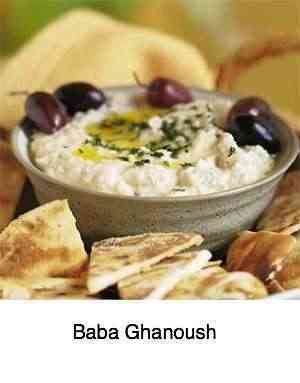 There are different spellings of baba ghanoush. Sesame tahini is much nicer than peanut butter, with a slightly nutty, bitter flavour; after the eggplant the second most important ingredient in baba ghanoush. Ground sesame seeds makes a delicious paste called tahini, not unlike peanut butter, only nicer in my opinion. Sesame Tahini is found in many traditional Mediterranean dishes like baba ghanoush, not just for its flavour, but because it provides certain amino acids, often deficient in many vegetarian diets. Make Tahini is not difficult; all you need is a cheap coffee grinder, available from Amazon for around $15, and a bulk source of sesame seeds for which you may have to hunt; frankly though, the people of the Mediterranean have been doing it for centuries, and I prefer to buy it; unlike most Western foods it's not highly processed. What are phytosterols is a vital question to grasp; they are plant compounds with a structure very similar to animal origin cholesterol; they compete with it for absorption. They have proven cholesterol lowering properties. They are present in all plant foods, but are particularly rich in the sesame seed extract in baba ghanoush. They have proven protective properties against prostatitis; men in particular should be eating phytosterol rich foods like baba ghanoush on a daily basis. Another particular good source is the avocado. Tired of all these vegetable dishes? Our favourite mutton stew; it will LOWER your cholesterol! Do you know what are phytosterols? Suffering from prostatitis? They reduce prostate inflammation and swelling. Dinkum. Scientifically proven. Lonely road of faith ... The struggle. Scientists tell us that mother's milk is the only inherent taste; all the rest are acquired. Continually feed your child sweet foods and soon he or she will acquire the taste; everything must be sweet or the little fellow will spit it out. Feed him chips every day, and soon he will want nothing else. Eggplant too is an acquired taste; if at the first meal it doesn't appeal, don't give up on it. You will soon gain a liking for it. There's an important principle here; we don't just eat foods that we like and taste delicious. If we did that we would soon be deficient in many important phytochemicals, vitamins and minerals. Who eats kale for its fantastic flavour? Avoid it and you're likely to get age onset macular degeneration. Five million Americans are blind for exactly that reason. 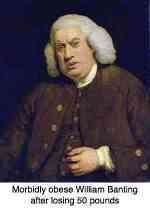 We need to persist a little with ourselves and our children; by and large we can acquire the taste of most foods. Having said that, New Zealand spinach I cannot abide. World's healthiest foods is one of my favourite sites; well researched, it cuts between opinion and fact when it comes to food. At eggplant you can read about the research done on this wonderful fruit; you'll be convinced of the virtues of this magnificent food; we call it an aubergine in Holland; it's the main ingredient in baba ghanoush. Healthy choice foods are probably even more important than having your subluxations cleared; my colleagues would crucify me for saying it; baba ghanoush is part of the deal. Fortunately it's not an either or. You can have a functionally healthy spine and enjoy healthy choice foods leading to a long and fulfilling life, not terminated midstream. Both mean a willingness to change; your chiropractor needs your help by doing your exercises faithfully, otherwise your subluxations will return next week. And you need to consider ways of getting off the black and white diet, meat and potatoes, and that means considering new foods like baba ghanoush and tahini, and flax seeds and all the coloured foods at our disposal. Eggplant recipes should be one of them. Why all this about baba ghanoush on a chiropractic help site you may well ask. Actually it's rather simple. There's strong research showing that lumbar arteries clogged with cholesterol have a much higher incidence of lower back pain. The damaged tissue simply doesn't get enough oxygen to heal properly. The spine is very much dependent on healthy arterial and venous networks able to bring fresh nutrients and oxygen to the site of injury, and remove waste products of metabolism. Hence the emphasis at Chiropractic Help on ways and means to lower your cholesterol without the use of nasty statins. A chiropractor with something to share with your colleagues? FREE ONLINE CHIROPRACTIC COURSES.